Click on any question below to see the answer. If you’re a first-time racer, check out our ‘Getting Started‘ section first. Can I race with a restricted drivers license? Yes you can. Remember that drag racing can be dangerous. Track officials will expect you to demonstrate safe driving at all times. Can I just turn up on the day and race? Yes you can, provided you have entered BEFORE the entry desk has closed. The entry desk usually closes at 9am on the Saturday ONLY (no entries are accepted on Sunday unless previously advertised), so make sure there in time to get your entry form completed and submitted, and have your car scrutineered. We recommend that you arrive at the track as early as possible – gates open at 7am! What gear do I need to be able to race? If your car runs faster than 11.00 seconds, you need to read the NZDRA Rule-book (including the rule supplements). What do I have to do to my car before I can race? A car that can pass the basic scrutineering checks. Can I just race on Sunday? No. We run two-day meetings (unless stated otherwise) and entries can only be accepted until the entry desk closes at 9am on Saturday. If we allowed Sunday entries we’d have to re-organise all of the brackets with the late entries, and some classes may have already begun their eliminations. It looks like it might rain – should I come to the track? We’ll do our best to let you know, but we are usually too busy to answer call, text messages, or Facebook private messages asking if the drags are on. Please check out our Facebook page, find a local Masterton weather report or if you can, get in touch with somebody who’s already at the track. What if it rains half way through a race meeting? It depends how far through the meeting we’ve gone. If it is raining in the morning we usually delay racing. If it rains after racing has started we usually delay until it stops and the track can dry. A drivers briefing will be usually be called to advise drivers of the ETA for racing, or if the meeting will be cancelled. Don’t leave until the drivers briefing has finished, as often the rain will clear up. IF it is a National series event, the allocation of points is detailed in the rule book NZDRA or IHRA rule book. There is an area at the track set aside for racers and crew members to camp, and there is a small fee to cover the security costs. There are no showers or powered sites due to the distance from the nearest buildings. Toilets are available for campers use. NOTE: Camping will be available on Friday & Saturday night for racers and crew only. Gates close on Friday night at 9.00pm and at 10.00pm on Saturday night with no exceptions. All people that choose to camp in their pit space are reminded to respect their neighbours, to ensure that they do not encroach onto their neighbours pit spaces, and you must ensure any tents are taken down before racing starts. Can I race using an IHRA licence at a NZDRA sanctioned meeting? Step 1: Make sure your IHRA tech inspection form is endorsed (has a stamp on it) showing your vehicle has been teched using the IHRANZ/MDI rules. If it doesn’t, talk to your IHRA tech inspector about getting the form stamped, or talk to a NZDRA tech inspector about getting your vehicle teched to the NZDRA rules. Arranging for a stamp or NZDRA tech takes time, so don’t leave it to the last minute. Please note that these items are a requirement of our sanctioning, and we have no discretion to waive them. You must have all four items or you cannot race. 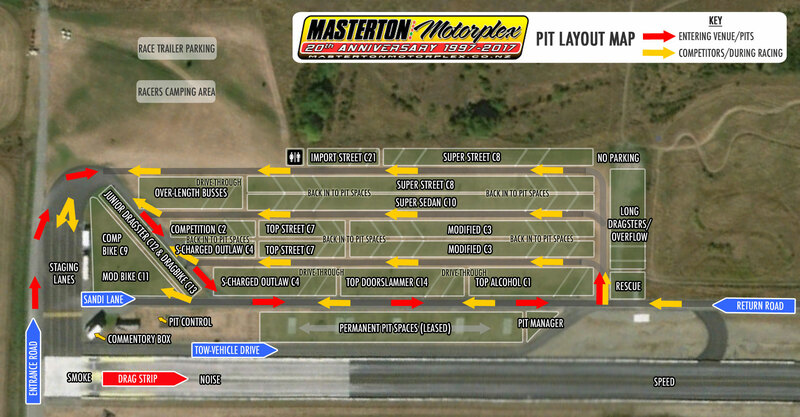 All Masterton Motorplex meetings are sanctioned with the NZDRA, except any meeting that is a round of the IHRA national series (this will be clearly indicated on the publicity for the meeting). Are we missing something? Please, let us know! Thanks also to the many contractors and individuals who have generously helped with the ongoing development and construction of the drag strip.